The iPad Mini 2 is one of the most anticipated mini tablets of 2013, and will further contribute to the phrase “the cannibalization of the iPad Mini” – a phrase that has come to characterize Apple sales within the last year. While the iPad has come to outperform skeptical assumptions about the product (starting with the name), the large iPad (the original) has become something of a heavy object for iOS users. When Google released its Nexus 7 last summer, the seven-inch tablet created a stir among customers and competing manufacturers. Apple’s response was to craft its own 7.9-inch tablet that would provide users with another reason to remain with Cupertino. Apple’s response didn’t disappoint, and the result of the iPad Mini release was a wave of consumerism that no longer seemed to care as much for the large iPad as before. Apple CEO Tim Cook did not seem to mind this; in so many words, he claimed that, if Apple did not take advantage of cannibalization, someone would. It was a preemptive strike, but one that worked in Cupertino’s favor. 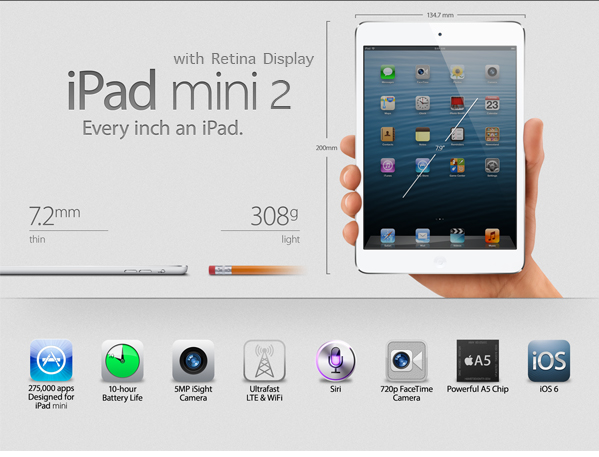 When Will We See the iPad Mini 2? Will the iPad Mini 2 cost the same or less than the original iPad Mini? Will there be an iPad Mini 3? Even after favorable iPad Mini reviews, something was missing: the gorgeous, Retina display that had come to characterize the iPad experience. The first Mini tablet released, though having an excellent size, came with the screen resolution of Apple’s larger, second-generation tablet. It was the one critique that Cupertino took to heart. The consistent demand for a Retina Mini tablet is the reason why tech analysts this week seem to believe that Apple will release an iPad Mini 2 in Q3 2013. The iPad Mini 2 is scheduled for a September-October release. A few days ago, CNET reported that the Fall tablet would not have the Retina display, but revised its report within two hours of the first announcement to include the contrary claim — that the iPad Mini 2 will have a Retina display. Retina technology has been something of a thorn in the side of Cupertino, seeing that reports have surfaced in prior days of difficulties with packing the Retina display into smaller tablets. While many predicted a Summer 2013 release of the coveted mini iPad, production difficulties will delay the tablet until this Fall. When the original iPad Mini emerged to compete with other small tablets on the market, analysts predicted that Apple would have to price the tablet at or around $199-$249 to compete with the then-king of the small tablets, the Google Nexus 7. Surprisingly, Apple’s $329 price tag was more of a premium price than anyone saw coming. The price tag did not deter consumers, and the iPad Mini became an instant success. KGI Securities analyst Ming-Chi Kuo says that Apple could release a tablet in Q3 2013 that not only has a Retina display, but could even have a lower price tag in the same price range as the Nexus 7. Apple did not include a Retina display in the original mini tablet to keep costs low; Cupertino could remove the back camera as well as reduce the internal storage to 8GB in the iPad Mini 2. This seems unlikely, due to Apple’s resistance to a lower-priced small tablet, but is a rumor worth considering. Ming-Chi Kuo has been right about other Apple rumors before, so we’ll have to wait and see on this one. “We see two refreshes coming. One in the second half of this year, then one in Q1[first quarter] of 2014. The Q1  device will have a Retina display plus an updated processor” (CNET). The iPad Mini 3 is scheduled for Spring 2014 and will have specs that improve upon that of the iPad Mini 2. A new processor (perhaps an A5X or A6 chip) will go into the third-generation iPad Mini, and, like its older counterpart the iPad 3 and iPad Mini 2, the iPad Mini 3 will have a Retina display touchscreen. Are you excited about two new iPad Minis on the market? Which one do you plan to buy? Let us know in the comments below.